Harrogate Choral Society last sang Messiah at St Aidans in 2015 and are delighted to return to this wonderful church in Leeds, home to the Brangwyn Mosaics. The church also has a fantastic acoustic to fill with the music of Handel. Soloists will be Katy Kelly, Soprano; Chloe Latchmore, Mezzo; Toby Ward, Tenor; and Edward Seymour, Bass. 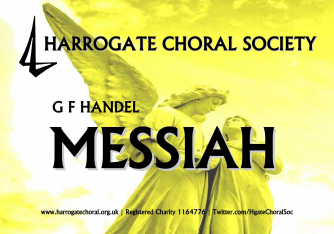 Harrogate Choral Society will be accompanied by Thomas Moore on organ and conducted by the HCS Music Director Andrew Padmore. Tickets priced at just £10, with £5 tickets for students, unwaged and under 16s, will be on sale soon from the HCS ticket sales team on tickets@harrogatechoral.org.uk or on the door on the night.